The next version of the SAR Table app is going to be accompanied by quite a few enhancements, one of them being the ability to use a previously built model to come up with predictions for empty cells in the matrix view. The additional feature follows up on some internal redesigning of the property prediction webservice that improves its performance, so now it works nicely on collections of a couple of hundred structures. In currently available versions of the SAR Table app, models can be used to view predicted properties (aka activities) for compounds that have been entered into the table, but have their property value left blank. This allows you to create virtual compounds by mixing and matching scaffolds and R-groups, then use the app+cloud to guestimate what the activity would be, based on its relationship to the current ensemble of compounds that do have the property value defined. 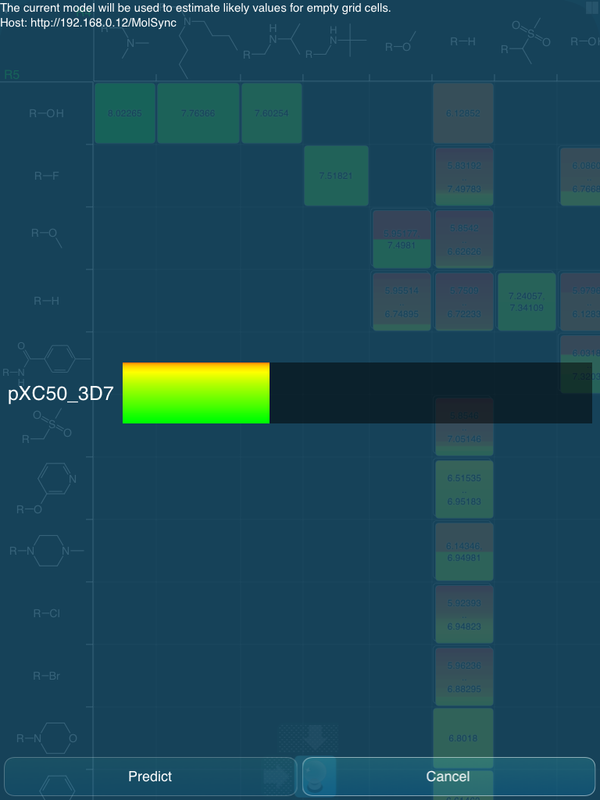 When using the matrix view to plot two dimensions against each other, predicted values for compounds are displayed in the same style. In the next version, though, it will be possible to generate predicted values for matrix cells for which there are no compounds in the table, i.e. blank cells. For example, in the screenshot shown above, there are no compounds for which R4=CH2N(Me2) and R5=F, and so that cell is blank. After applying the predictive model to all empty cells, each of these formerly blank squares now shows a circle. Each circle is displayed with a coloured hue, which provides an indication of the range of predicted activities. Because there are usually more degrees of freedom than are displayed in the matrix (in this case: scaffold, R1, R2 and R3), the webservice performs a stampling of the full combinatorial space, makes a prediction for each hypothetical compound, and returns an average and standard deviation for each of the cells. 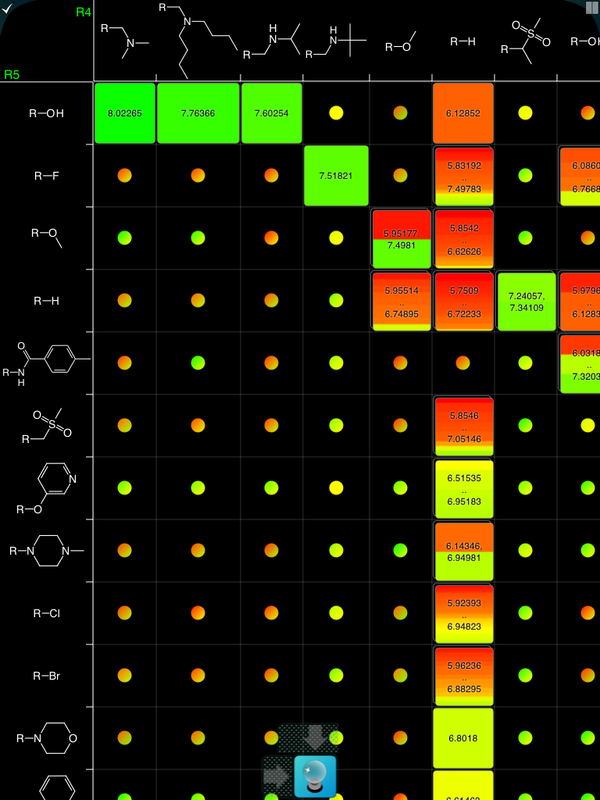 The red-yellow-green shades (as configured for this particular scheme) indicate the diversity of results; mostly red means all hypothetical cases predicted badly, mostly green means that they all came out well, and a spread-out spectrum indicates that the off-matrix degrees of freedom have a strong influence on whether the compounds are active or not. The virtual compound creation & prediction is done by a webservice. The process bar shows a rainbow hue, which gives an indication of the diversity of results overall. Once it reaches the right hand side of the screen, the results can be applied to the matrix view. This new feature significantly improves the utility of the SAR Table app for postulating new compounds to make within a series. This and other recently added features are intended to encourage chemists to use this kind of software iteratively with their experiment design, rather than only at the beginning or end of a campaign. By using the app to quickly draw attention to scaffold & substituent combinations that look promising, given current knowledge, the experimentalist can synthesise and measure the new compound and feed it back into the app. If the model gave a true positive, that’s great; but either way, the new datapoint makes the model better for next time. The new version will be submitted to the iTunes AppStore as soon as it has undergone a bit more testing.